It’s possible to do so without losing any limbs, I promise! If she read my question, I’m thinking she probably rolled her eyes. I didn’t get an answer, I do know that. But at some point shortly thereafter, I realized you could use a carrot peeler (very carefully) to do the job. Between that and a large, very sharp, heavy-duty chef’s knife, peeling and cutting up a butternut squash is actually a fairly easy task. Here’s how to do it! 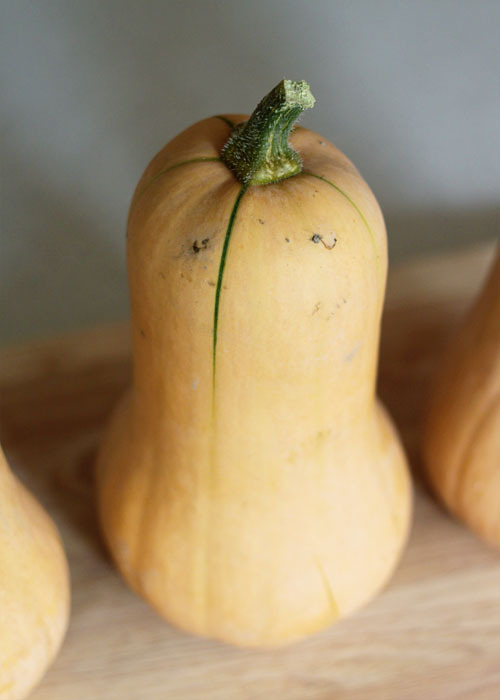 Choose a firm squash that is heavy for its size, with few blemishes, a firmly intact stem, and no soft spots. 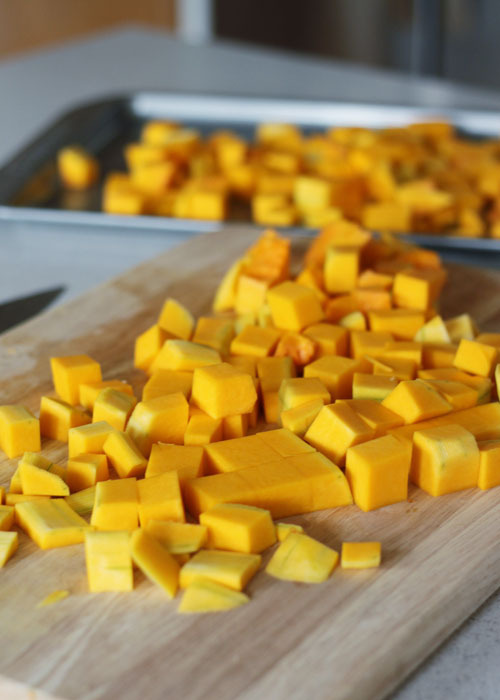 Grab a large cutting board, a vegetable peeler, and a heavy-duty, sharp chef’s knife. Set the butternut squash firmly on the cutting board and, using the carrot/vegetable peeler, peel off bits from top to bottom. 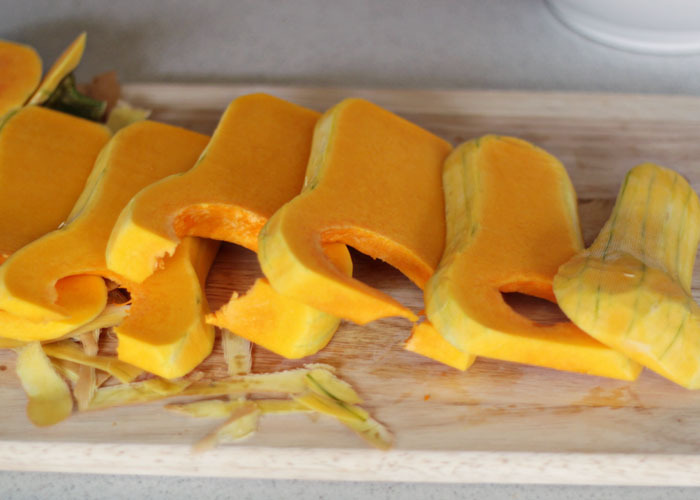 I start with the upper part of the squash and the bottom flat on the board, then tilt the squash to carefully peel the bits of peel off of the curved bottom bulbous part. Leave some of the skin on the top and the bottom – that, along with the stem, will help you keep your grip as you get more and more peel off of that slippery, hefty sucker. I have kind of a crappy old vegetable peeler, and even that works fine. Carefully peel, peel, peel, until all the peel is gone. Excellent! See, Martha? That’s all you had to tell me! Now lay the squash on its side and grip it firmly (but far away from the knife). Lop off the top and the bottom. And then place the bottom cut end on the cutting board so it’s got nice solid footing, and cut it in half. You will probably need to press on the back of the knife with the heel of your hand. Slowly, slowly rock and press the knife like a teeter totter to make your way through it until … voila! Two halves. 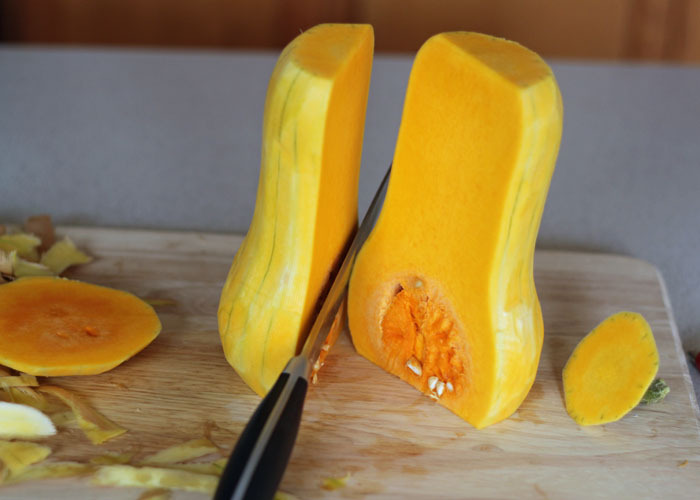 If you have an especially large and unwieldy squash, you can cut it in half the other direction too, separating the neck and the body, so that you have four pieces to work with (a clever badger shows you more about that in this awesome tutorial). Scoop out the seeds and innards with a spoon and discard. Cut each half into slices. And then cut each slice into spears. And then rotate the spears 45 degrees and, a few at a time, cut the spears into cubes. I like about 3/4-inch cubes for roasting. And you still have ALL your limbs! Note: I really can’t guarantee that you’ll keep all of your limbs during this process, but I do believe the odds are in your favor. Or just toss it with a tablespoon or two of olive oil and some salt and pepper, spread it in a single layer on cookie sheets, and roast in a 400-degree oven, stirring occasionally, until tender with golden brown bits here and there – about 45 minutes or so. 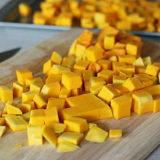 Set the butternut squash firmly on a cutting board and, using a vegetable peeler, peel off bits from top to bottom. 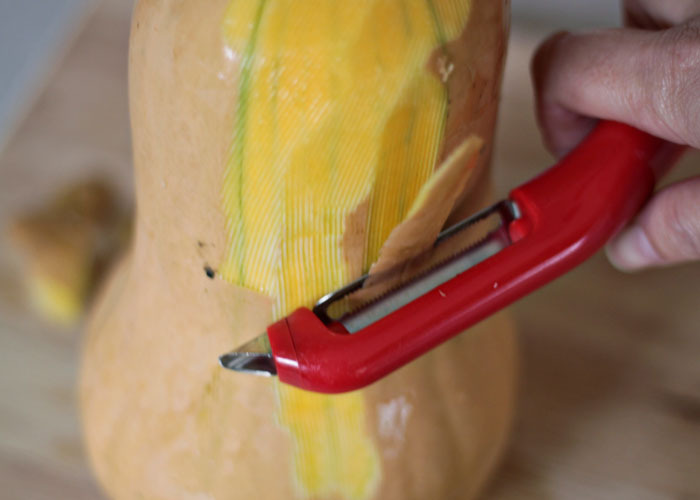 I start with the upper part of the squash and the bottom flat on the board, then tilt the squash to carefully peel the bits of peel off of the curved bottom bulbous part. 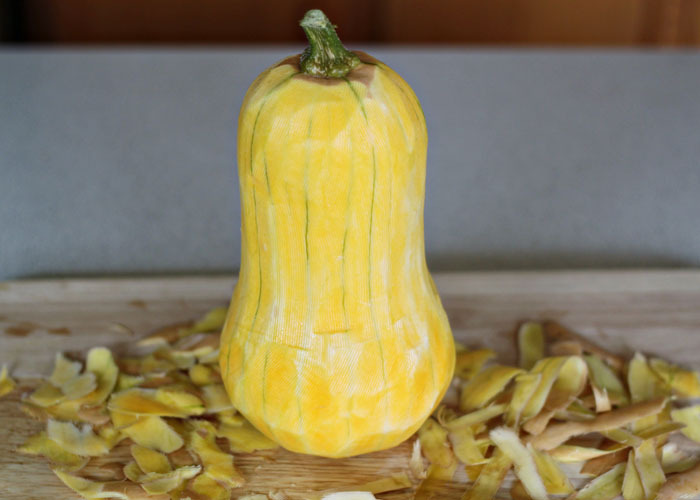 Leave some of the skin on the top and the bottom – that, along with the stem, will help you keep your grip on the slippery squash. Lay the squash on its side and grip it firmly (but far away from the knife). Lop off the top and the bottom. This gives you a flat surface that will help you keep the squash stable as you proceed. Cut each half into slices. 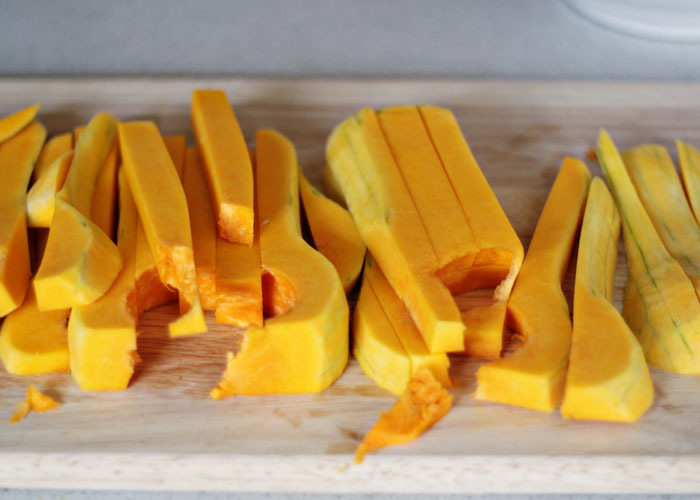 Cut the slices into spears. And then, a few at a time, cut the spears into cubes. I like about 3/4-inch cubes for roasting. That’s it, you’re done, and you still have all of your fingers! You seriously just made that look so easy. You make this look WAY too easy! 😉 I am going to have to test out your method! Great tips! Butternut squash can be some dangerous stuff! Wow this is a really great tutorial. I actually use a hammer. 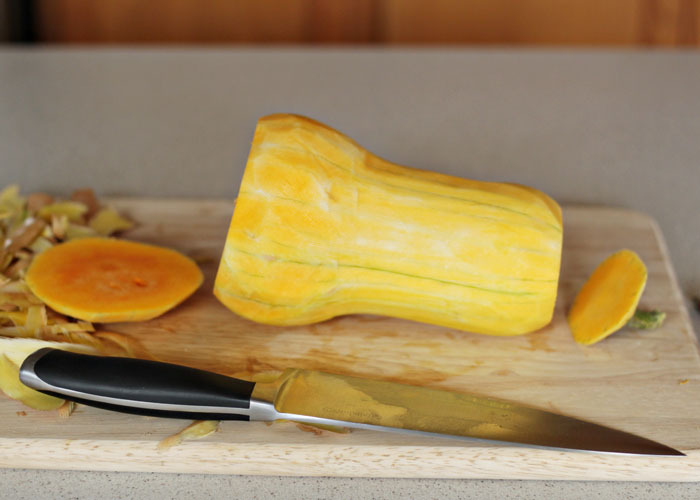 I position my knife and make a little groove where I want it to go into the squash then I cover the tang with a dishtowel and hammer the blade through the squash. 🙂 A little “This Old Butternut” but your idea of peeling first is awesome! My way is way easier. 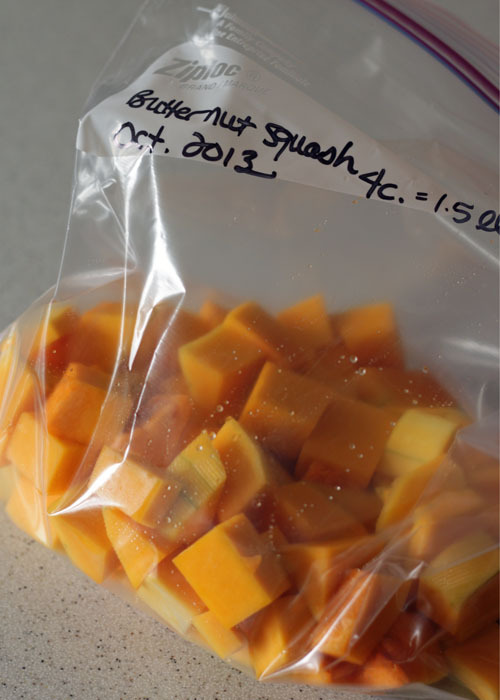 Pierce whole butternut squash with a fork, or sharp knife, in several places, put whole pierced squash on a microwave safe plate, and micrwave till soft , remove from microwave ,and easily cut in half ,scoop out seeds ,then spoon out pulp. Thanks so much! It sounds much better than baking and pulling out the moist seeds after the squash has been cooked. 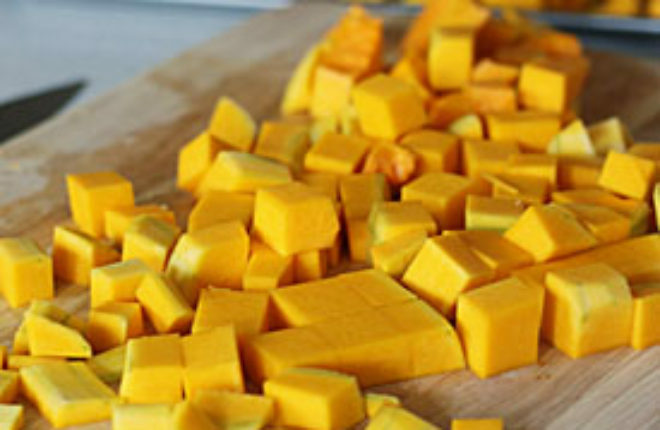 I could eat a bucket of butternut squash. Ohhhhh my gosh…that first one there on your list of yummy things..
..i’ll let you know how it goes.. Thank you so much for your post!! I have been putting off doing anything with this big ole hard butternut squash for over a month! But tonite I decided that’s it ! Cook it ! Well, I searched the Internet and when I got to your site and read that”I even have an old crappy peeler” and it worked! I thought, well I have one of those!! Low and behold that sentence gave me the courage to attack this butternut along with your beautiful instructions and pictures! Voila! I can now roast my beautifully 3/4 ” cubed squash!! Thank you again Karen! I could not believe my old crappy peeler conquered this job which I thought was insurmountable!! ?? ?